A maths professor has worked out an equation to calculate how long into a car journey it takes a child to ask: "Are we nearly there yet?" Professor Dwight Barkley, of Warwick University, calculates there are three key factors that decide the timing of the wearisome question. Crucial in putting off the first prompt about the proximity of the destination are on-board activities for children. So no activities equals a question before leaving the driveway, he said. 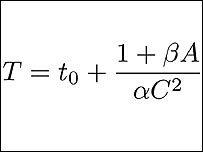 The equation for the time it takes for a child to ask the question is: one, plus the number of activities to do, divided by the number of children in the car squared. To get the final answer, that figure is then added to the time it took the family to get into the car and set off on their journey. "This equation can be a fun way to think about the problem of keeping children entertained on a family car journey." Is there a happiness formula?